When a 7.8-magnitude earthquake struck San Francisco on the morning of April 18, 1906, it triggered three days of fires, destroying almost 30,000 structures and leaving more than half the city’s residents homeless. Once the embers cooled, the quake spurred an equally thorough rebuilding effort, first for roofs over people’s heads, but then for the creature comforts that would transform all those new houses into homes. Dirk van Erp was uniquely positioned to take advantage of the home-furnishings boom the earthquake inadvertently created. 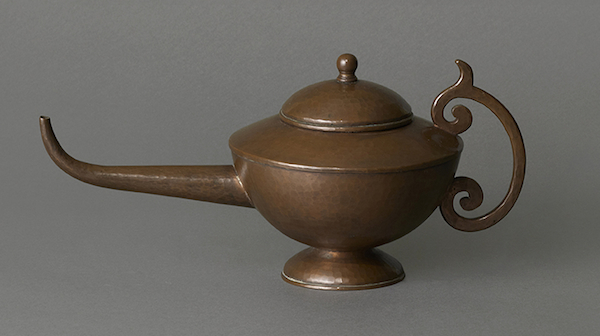 Considered today the leading Arts and Crafts coppersmith of the early 20th century, van Erp produced everything from coal buckets and fireplace sets to candlesticks, vases, and lamps, all hand-hammered in studios on both sides of San Francisco Bay. 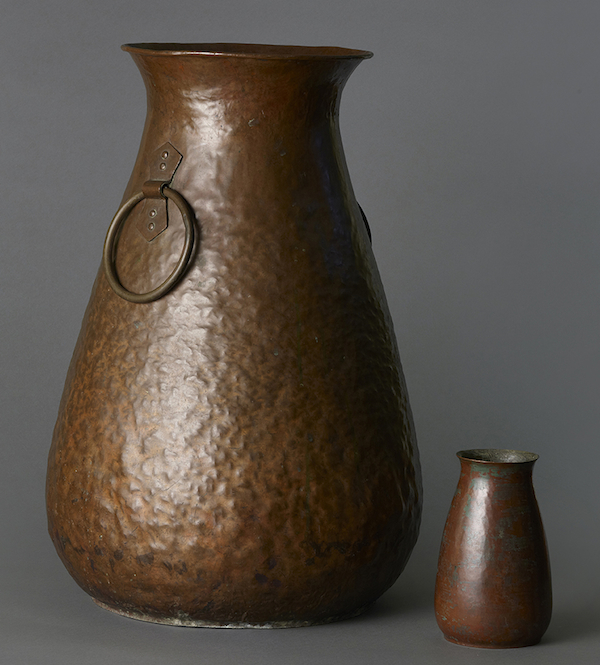 During his 25-year career, van Erp taught several generations of coppersmiths the tricks of the trade, helping to make the San Francisco Bay Area a center for copper objects and design. Born in the Netherlands and raised in a family of coppersmiths, van Erp arrived in the United States in 1890 and settled in San Francisco around 1891. After a failed attempt at a plumbing business and an equally unsuccessful detour north to Alaska to try to cash in on the Klondike Gold Rush, in 1900 van Erp took a job as a coppersmith at the Mare Island Naval Shipyard near Vallejo, California, where he lived with his wife, Mary, and their daughter, Agatha. The couple’s son, William, was born there the following year. Above: The Copper Shop in Oakland, California, circa 1909. Van Erp is on the right, with a young Harry Dixon second from left. 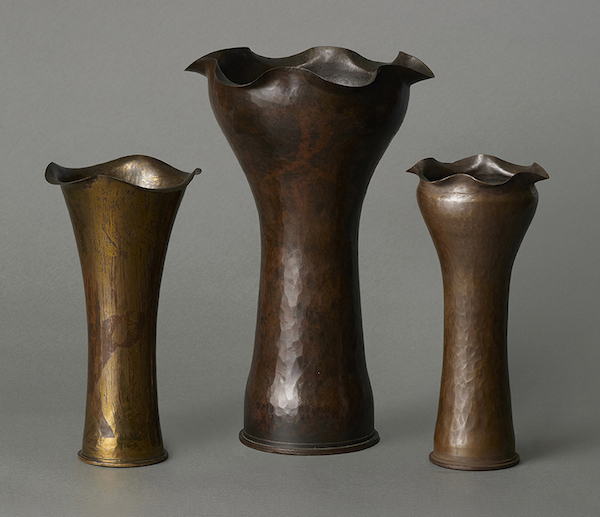 Top: Two vases made from spent artillery shell casings. The one on the left has a “warty” surface. Naturally many of van Erp’s earliest forms were cylindrical, following the shape of his source materials. Some had modest, trumpet-like flares at their tops, while others had wavy, undulating openings. Surface treatments ranged from irregular grids of hammer marks to masses of “warty” bumps to columns of deep dimples. 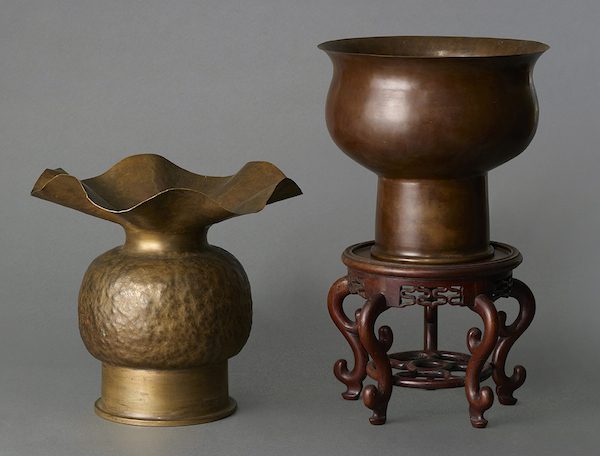 But soon the forms evolved to include wide, footed punch bowls and vases with gourd-like, bulbous bottoms. Within a few years, van Erp’s hobby had become a second source of income, as the blue-collar tradesman sold his handsome, decorative pieces through a prominent San Francisco art gallery. 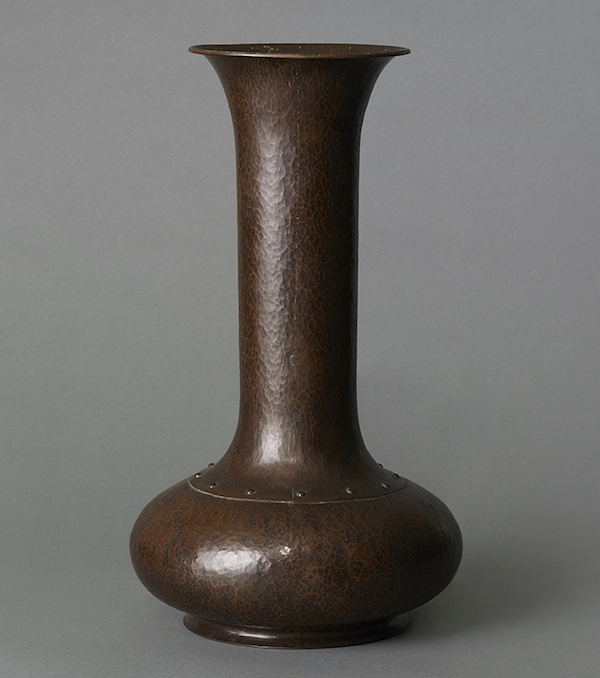 A copper log holder with with iron feet, by Dirk van Erp, from 1910-1913. Harry St. John Dixon was one of the many coppersmiths who passed through the van Erp shop. 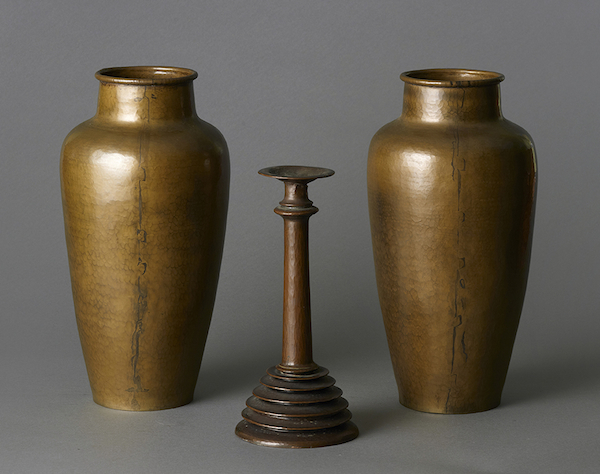 This pair of Dixon vases and a candlestick are from around 1920. But Bostrom got knowledgeable all the same, and as he learned more about van Erp, he realized that van Erp had influenced dozens of San Francisco Bay Area craftsmen, many of whom got their start hammering copper for the Dutchman. 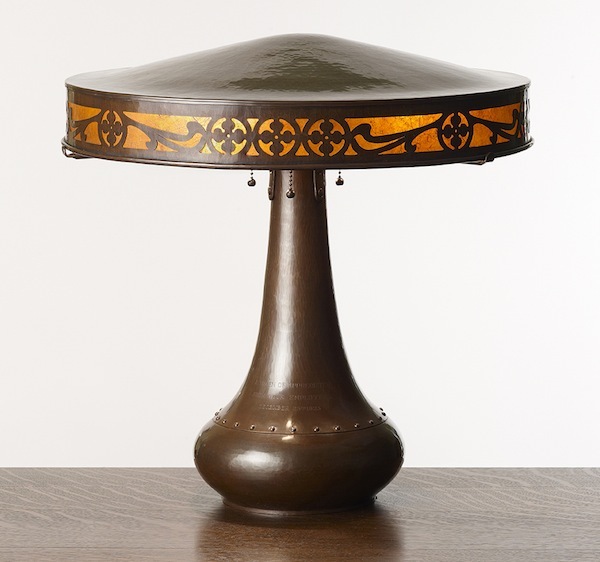 Van Erp’s nephew August Tiesselinck is said to have influenced the design of this van Erp flat-top lamp, circa 1923. 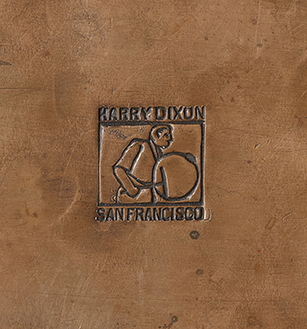 One of van Erp’s first protégés was Harry St. John Dixon, not to be confused with Harry L. Dixon, another Bay Area coppersmith from the beginning of the 20th century. 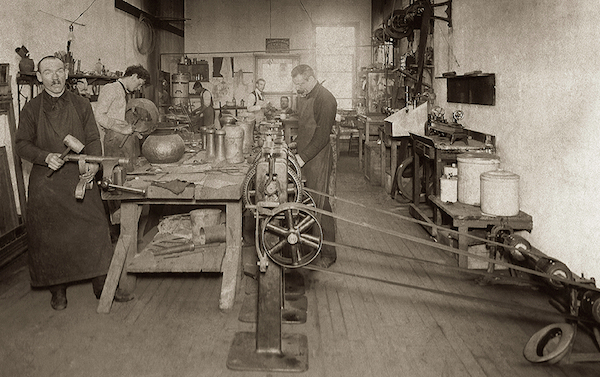 Dixon came to van Erp’s shop with little training, working for him from 1909 until 1911, when van Erp fired the young man. “Had it coming to me,” Dixon reportedly said. 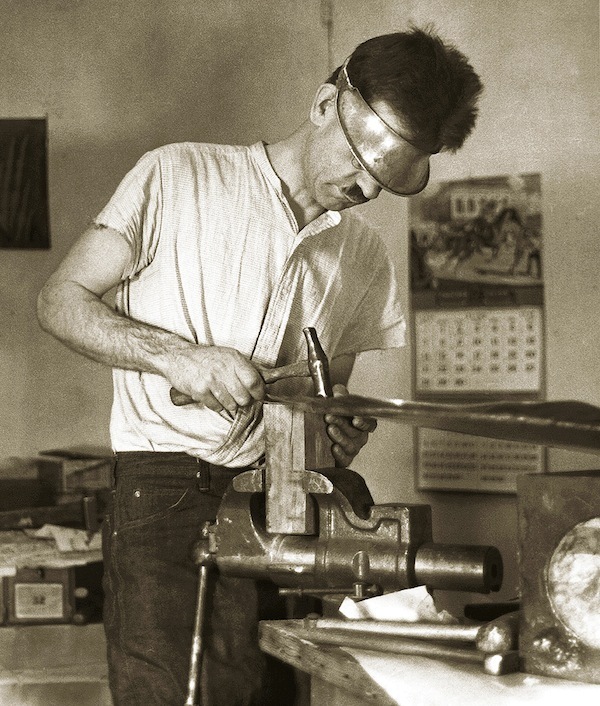 In fact, in a 1964 interview a few years before his death in 1967, Dixon had nothing but praise for his former boss and mentor: “I learned how to braze and how to draw the metal in, how to set it up; we made bowls, we made jars, we made large trays. Anything that came along.” Indeed, the experience was productive enough to land Dixon a job working for respected metalworker Lillian Palmer (described in a San Francisco Call headline from 1907 as “An Ingenious Girl Worker In Metals”). Dixon stayed with Palmer for six years before opening his own establishment in San Francisco in 1920. Crossing paths with Dixon at both van Erp’s and Palmer’s copper shops was August Tiesselinck, van Erp’s nephew, who sailed from Rotterdam in 1911 to work with his uncle in America. Unlike Dixon, the youth arrived an accomplished metalsmith. In fact, Tiesselinck was hired away from van Erp by Palmer, who used his designs for the curvilinear shades in some of her lamps. By 1922, though, Tiesselinck was back at his uncle’s, making his mark on all sorts of van Erp pieces, including van Erp’s flat-top lamps. Of course, two of the most important coppersmiths to pass through the van Erp shop were van Erp’s children. Agatha was teaching metalworking at the San Francisco Art Institute by the age of 18. When the United States entered World War I, Agatha and her brother, William, who at 16 was too young to enlist, kept the van Erp shop running while their father joined Dixon, Tiesselinck, and other tradesmen at the Union Iron Works in San Francisco, where they plied their skills in the service of the war effort. 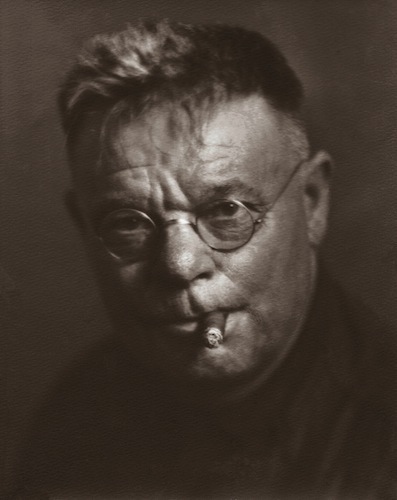 Dirk van Erp, circa 1920. Agatha may have gotten the earlier start in copper, but it was William who inherited the business after their parents died (within four hours of each other) in 1933. William made his mark on the business during the Great Depression by diversifying into metals such as brass and silver. He also pushed the firm into new stylistic realms, giving the green light to candlesticks, pitchers, and other pieces whose look was decidedly Art Deco. 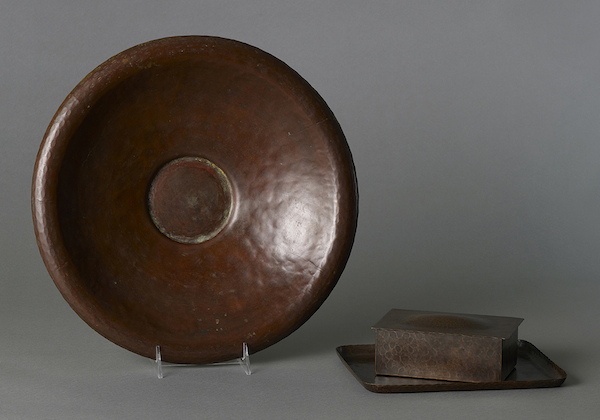 After World War II, the dark, patinated surfaces of copper gave way to shinier things, as the clean lines of Mid-Century Modern elbowed aside styles like Arts and Crafts, which were deemed too old-fashioned and fusty. Today, though, many people are hungry again for the hand-hammered look of Arts and Crafts, which conveys an air of authenticity that can’t be found in the handsome if soulless offerings at Crate & Barrel and IKEA. For these people, Dirk van Erp’s work resonates strongly. Not only were his pieces handmade, he came by his aesthetic honestly, forced to prove himself in the rough-and-tumble world of blue-collar tradesmen before being embraced by the art-world elites. 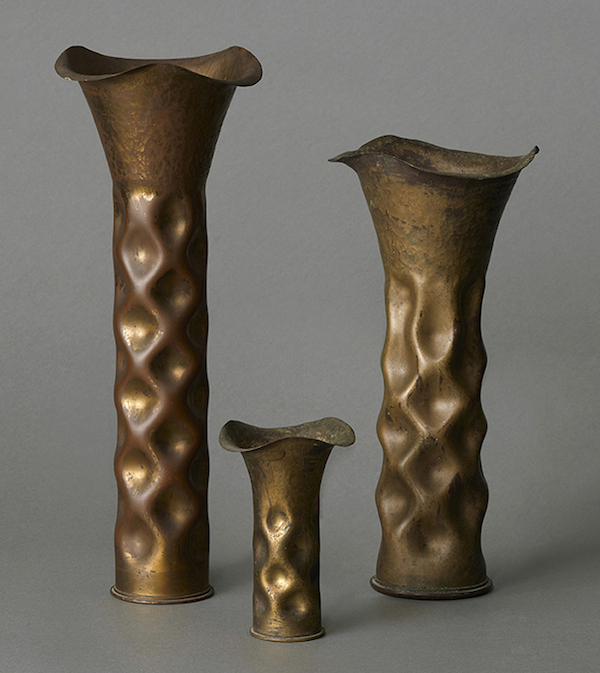 Van Erp vases from 1902 to 1908 were made out of spent artillery shells. These shells were manufactured by Winchester and UMC, which was owned by Remington. Van Erp hammered deep dimples into the sides of some of his shell vases. 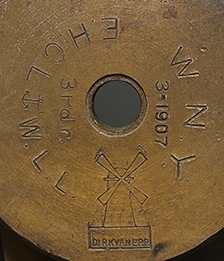 This is the only shell vase known to bear Dirk van Erp's windmill mark. One hammering technique, employed by van Erp on this circa 1910 tray, produced radiating lines. A short, squat van Erp lamp, circa 1911-1912. 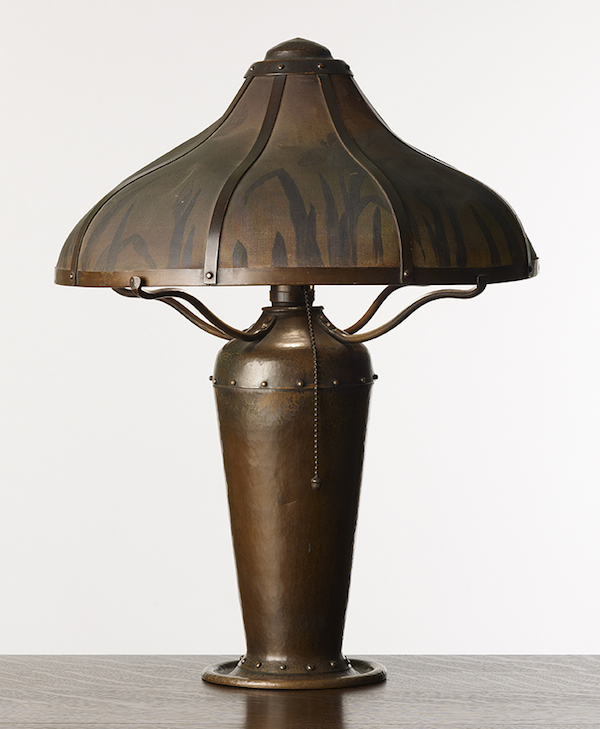 This circa 1911-1912 van Erp lamp features an inverted-trumpet base. The mark on the bottom of this van Erp ‘Aladdin’ lamp places it from between 1915 and 1929. 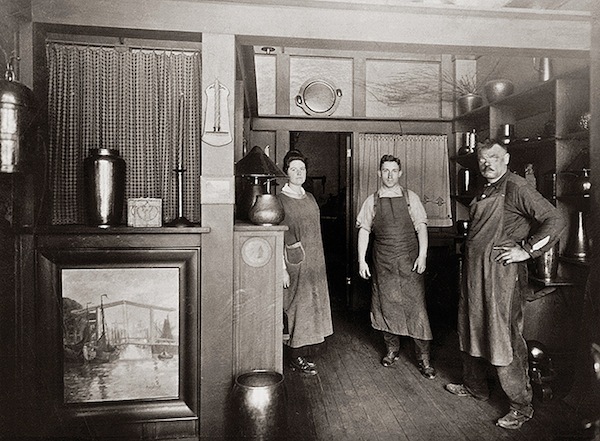 From left to right: Agatha van Erp, August Tiesselinck, and Dirk van Erp in the coppersmith's studio on Sutter Street in San Francisco, circa 1912. 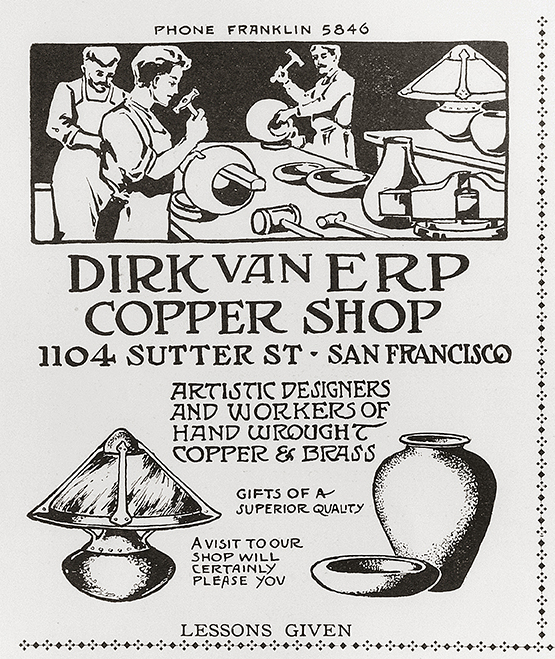 This ad for Dirk van Erp's Copper Shop ran in the California School of Arts & Crafts' 1914 yearbook. 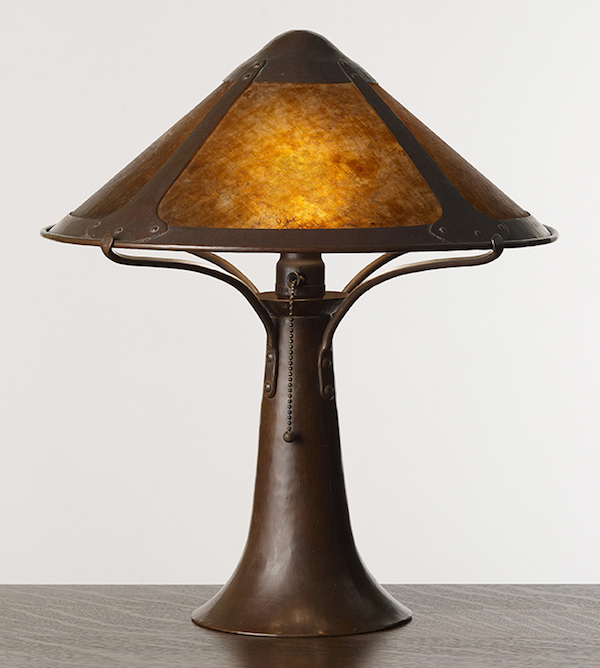 After working for his uncle from 1911 to 1914, August Tiesselinck became foreman of the Lillian Palmer Shop, for whom he designed the curvilinear shades on this lamp. 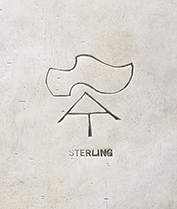 In the 1920s, van Erp's nephew August Tiesselinck used a wooden shoe along with his initials for his mark. When he was on his own during the early 1920s, August Tiesselinck branched out beyond copper to produce sterling-silver pieces such as these. Harry St. John Dixon, shown here in 1929, came to van Erp with little experience in 1909. Harry Dixon learned how to produce a "warty" surface from his first employer, Dirk van Erp. Like Tiesselinck, Dixon left van Erp to work for Lillian Palmer. 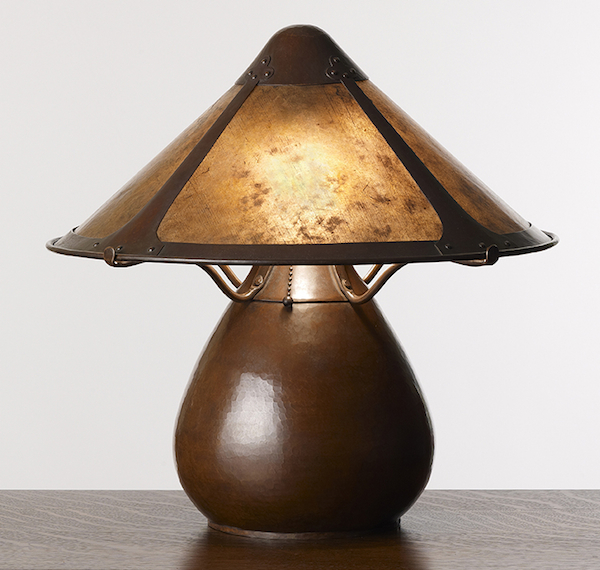 The base of this Palmer lamp is thought to be of Dixon's design. 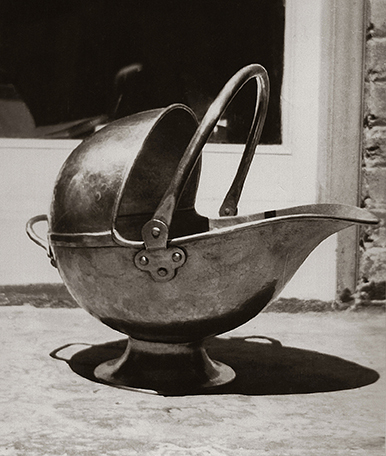 A classic use of hammered copper was a coal bucket. This one is by Harry Dixon, circa 1927. Dixon was famous for his copper-and-brass puzzle boxes, no two of which were alike. Dixon's mark was designed by his brother, the painter Maynard Dixon. 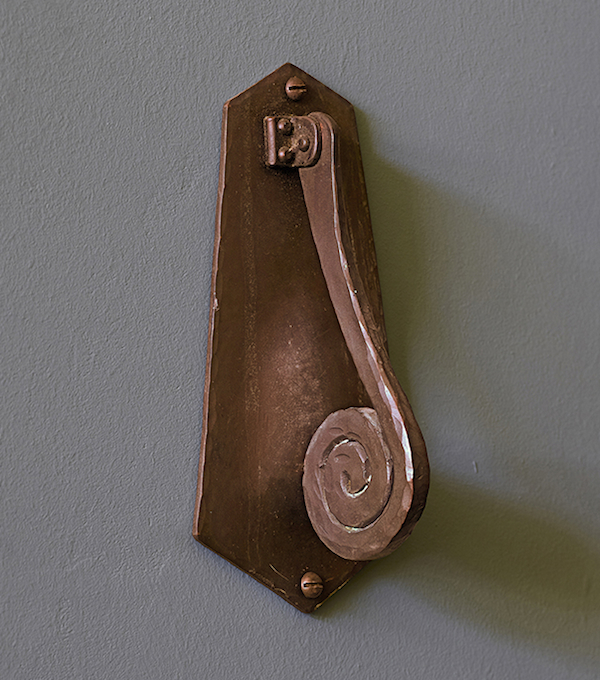 Another category of decorative hardware pieces by Dixon included door knockers. 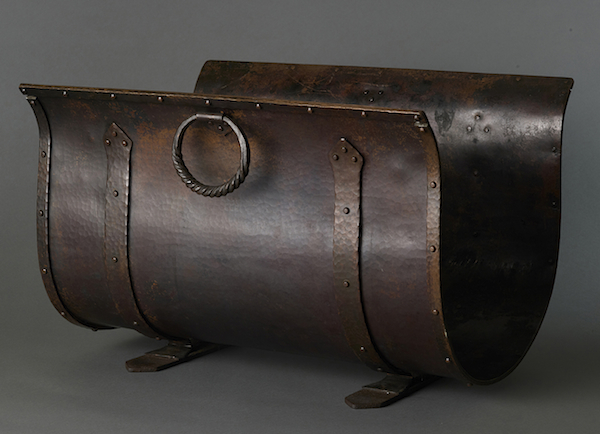 Frederick Brosi, who sold pieces such as this one through San Francisco's Ye Olde Copper Shoppe, also worked at the Mare Island Naval Shipyard, but did not overlap with van Erp. Armenac Hairenian arrived in San Francisco from Turkey in 1921 and worked for van Erp before opening The Art Copper Shop in 1925. 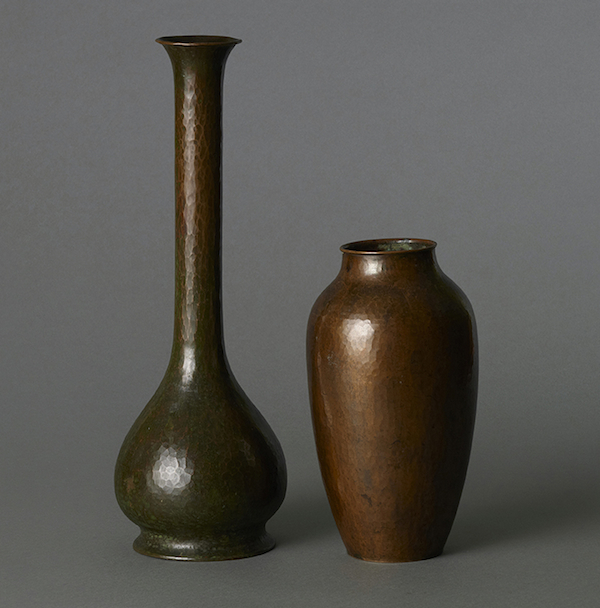 These modernist vases are indicative of his work. Like van Erp, Dixon had his own protégés, including Byard Tully, who made pieces such as these. 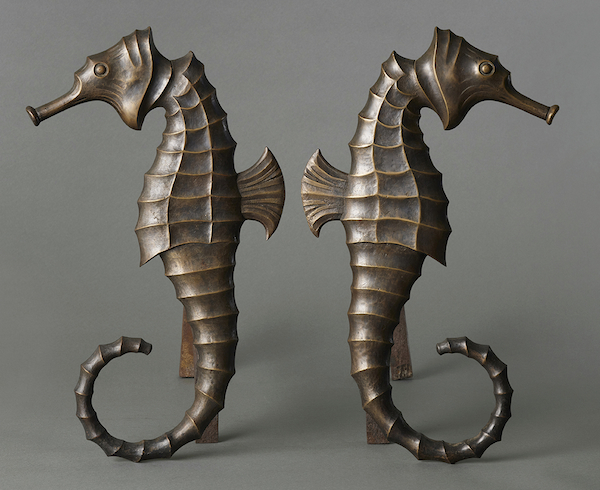 After William van Erp took over his father's firm in 1933, he branched out into other forms, such as these andirons in the shapes of seahorses. 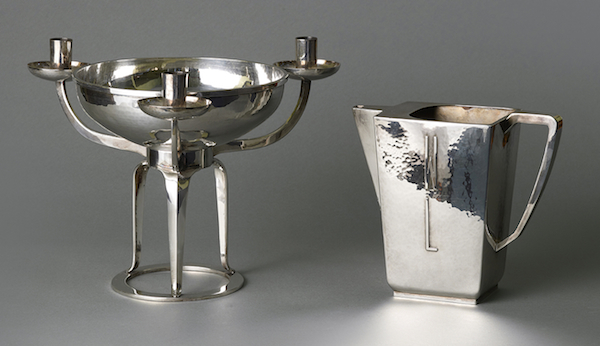 William van Erp recognized the appeal of Art Deco, and pushed the company to work in other materials, as seen in this silverplated candelabra and creamer, both post-World War II. 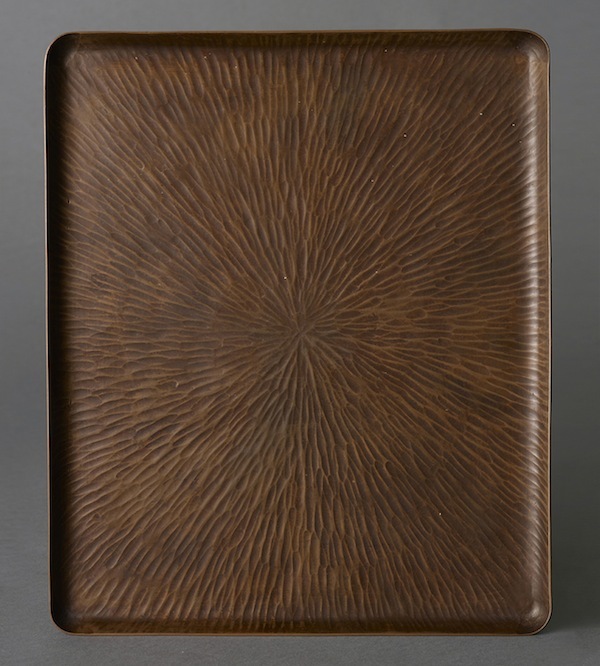 It is strange not to see any mention in this otherwise very informative post of the London and Chicago-trained D’Arcy Gaw, who was briefly van Erp’s business and creative partner circa 1910 and heavily influenced his turn towards the Arts & Crafts style. 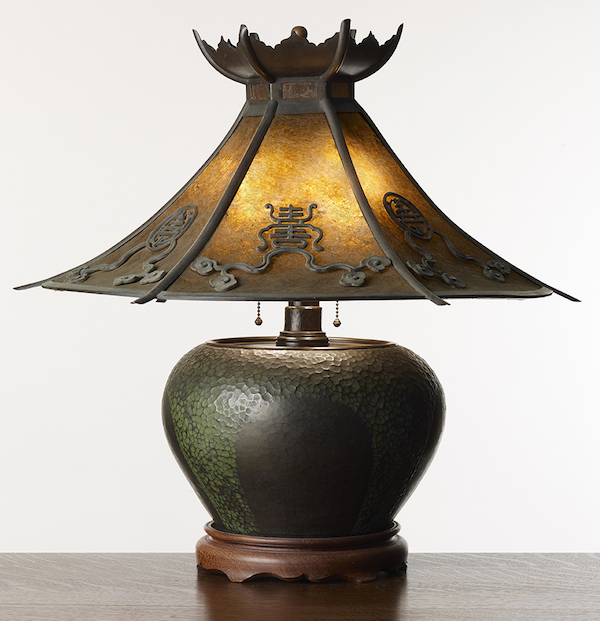 The earliest and best of the iconic “van Erp” mica-shaded, fat bellied lamps have her designer’s mark on them. For Karleen: If you contact Isak Lindenauer antiques in San Francisco or California Historical Design in Berkeley, I am sure one of them could lead you to Van Erp’s grandchildren.